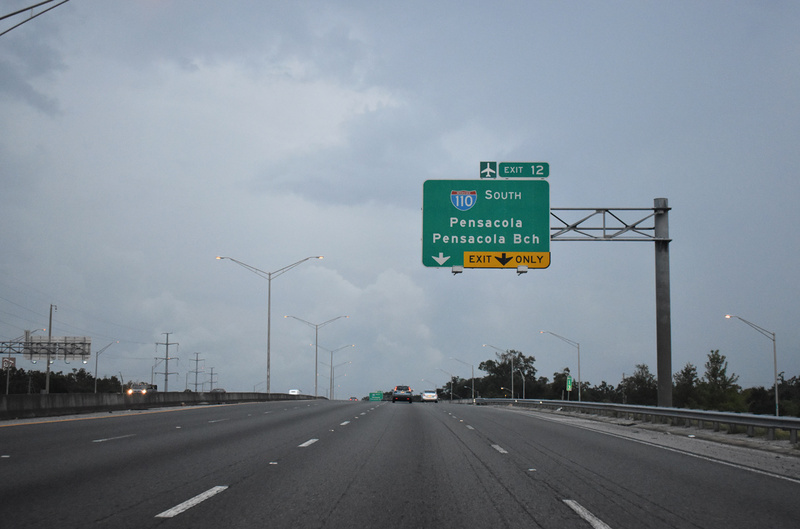 Interstate 110 links Downtown Pensacola with Interstate 10 at Ferry Pass beyond the Pensacola city line. 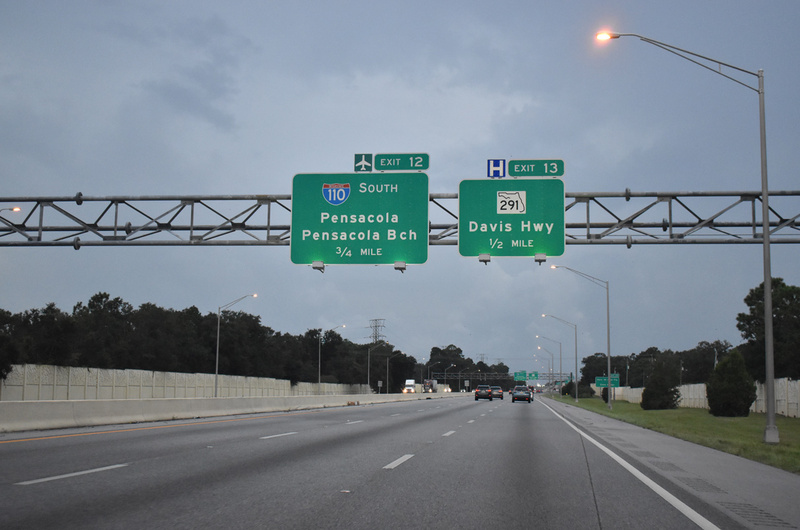 Interstate 110 facilitates traffic from Interstate 10 south to Downtown Pensacola and the Pensacola Bay Bridge south to Gulf Breeze and Pensacola Beach. 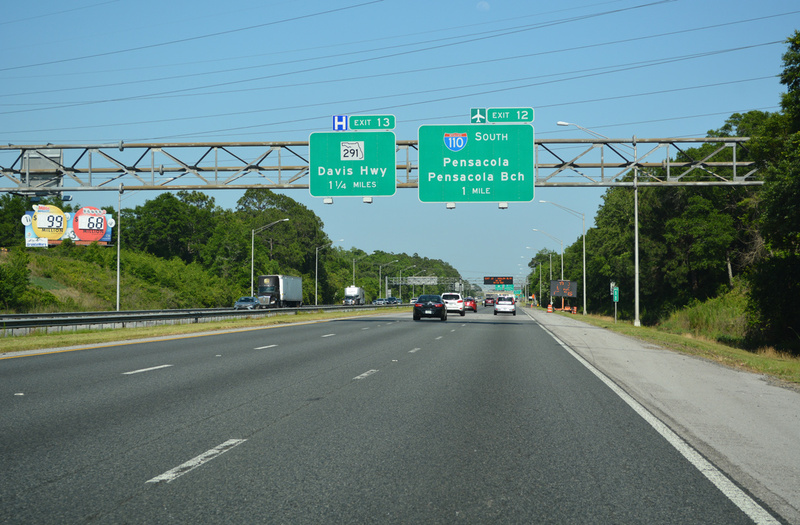 The freeway serves commuters and Pensacola Naval Air Station traffic via busy interchanges with Fairfield Road (SR 295), Brent Lane (SR 296), Airport Boulevard (SR 750) and connections with Davis Highway (SR 291) just east of the north end at I-10. 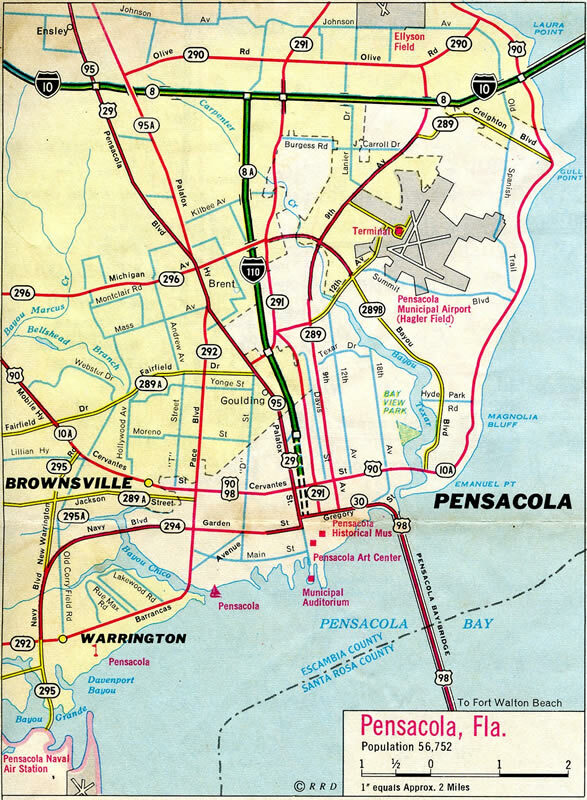 1968 – Interstate 110 first proposed to extend further south to what was then the city limits of Pensacola. 1969 – Interstate 110 constructed from Maxwell Street north to Interstate 10 (first segment to open). 1978 – Interstate 110 opened from Gregory St. north to Maxwell Street. Interstate 110 is now complete. Work completed in July 2009 expanded the freeway to six overall lanes from the Maxwell/Jordan Street half diamond interchange northward to the Florida 742 (Creighton Road) overpass. 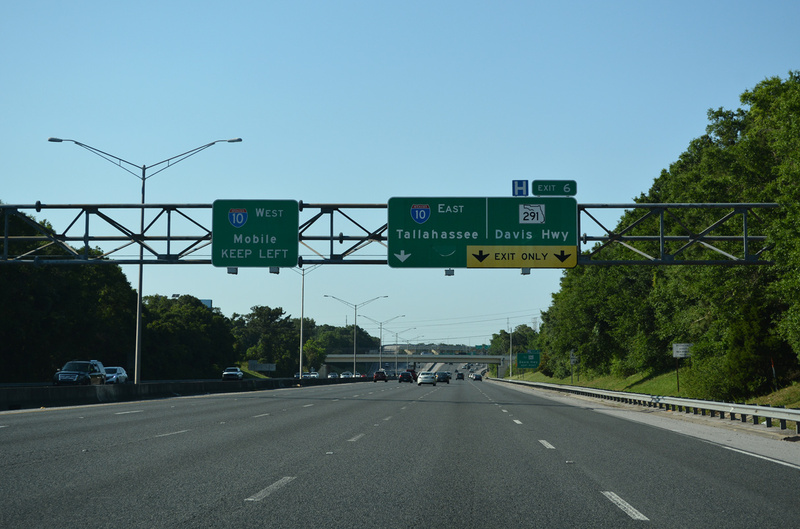 Included in the $58 million rebuild of the freeway was the addition of a new split-diamond interchange with Airport Boulevard (Florida 750) and conversion of the diamond interchange with Florida 295 (Fairfield Drive) to a parclo interchange. This work coincided with the I-10/110 project from early 2007 onward. Costing $76 million, the I-10/110 project was completed in fall of 2008. Construction entailed the six-laning of Interstate 10 from east of the Old Palafox Highway (Escambia County 95A) overpass to beyond the Davis Highway (Florida 291) interchange (Exit 13), and six-laning of Interstate 110 from I-10 southward to just north of the Airport Road overpass. Improvements to the Interstate 10/110 trumpet interchange included the addition of a flyover ramp from I-10 west to I-110 south and the addition of collector distributor roadways to separate local and through traffic between I-10, I-110 and SR 291. SR 291 was also widened to six lanes from I-10 south to former University Mall (now University Town Plaza) as well. Construction began in 2002. Associated with the Interstate 10/110 project was the construction of a new Creighton Road overpass over Interstate 110. This new alignment extended the five lane arterial to Hilburn Road where the state road reunites with the original SR 742 alignment along Burgess Road. SR 742 comprises a five-lane arterial east from Hilburn Road to SR 289 (Ninth Avenue). A widening of Creighton Road between Davis Highway and Ninth Avenue was completed by 1996. Future plans, though not yet funded by the state legislature, call for extending Creighton Road further west to U.S. Highway 29. Airport Boulevard westbound at the northbound on-ramp to Interstate 110. Photo taken 03/20/12. Interstate 110 ending at Maxwell Street in 1970. 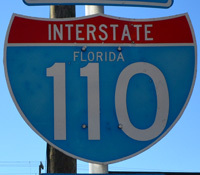 Interstate 110 is assigned the hidden Florida State Road number of 8A. The suffixed route is derived from State Road 8, the counterpart of Interstate 10 across the state. 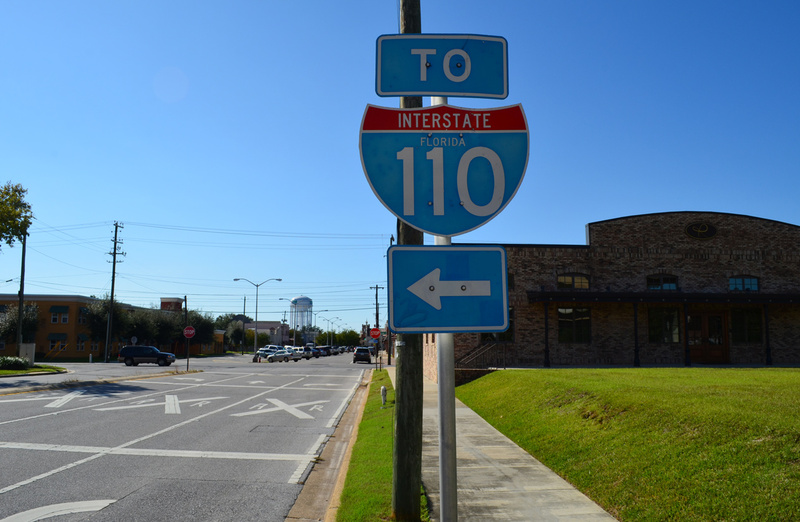 Plans for a northward extension of Interstate 110 to Nine Mile Road (Alternate U.S. 90) have been dropped for the near term due to funding related issues. Long-range plans still propose a further extension of the freeway to Interstate 65. 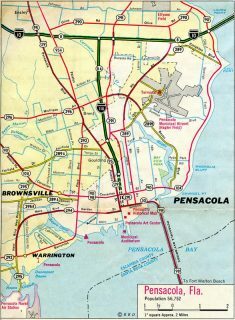 A report was issued during 2001 pertaining to a possible replacement of the four-lane U.S. 98 Pensacola Bay Bridge. A six-lane facility was sought with two plans presented. One plan involved widening the existing bridge while the other incorporating the construction of a new span (with the possibility of retaining the old one as well). It was thought that a new or upgraded bridge would directly connect with Interstate 110 via a limited access viaduct. This in effect, would extend Interstate 110 southward to the bay or possibly the south end of the bridge at Gulf Breeze. Construction of the new Pensacola Bay Bridge underway in spring 2017 replaces the current four-lane crossing for U.S. 98 built in 1960. The $398.5 million project will accommodate six overall lanes with full inside and outside shoulders, and a ten foot multi use path in each direction. The first span should be completed in early 2019, with overall work finished in mid-2020. 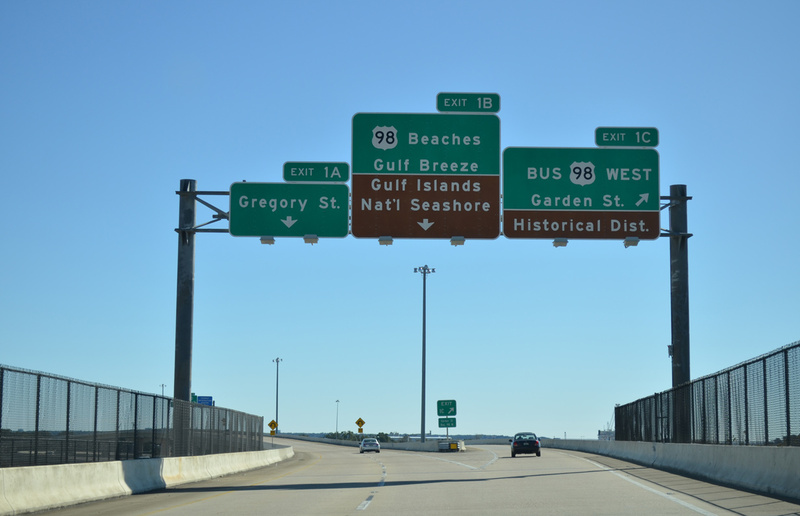 There are no plans to upgrade U.S. 98 to limited access standards from the new bridge west to the current south end of I-110. 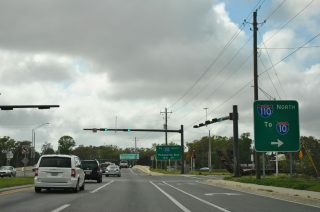 The two-mile guide sign for the northbound conclusion of Interstate 110 precedes the Florida 296 (Brent Lane) under crossing. The eastbound ramp to Interstate 10 is signed as Exit 6. Photo taken 11/19/15. Reconstruction of the Interstates 10-110 junction between 2002 and 2008 expanded the northern extent of I-110 to as wide as ten overall lanes. 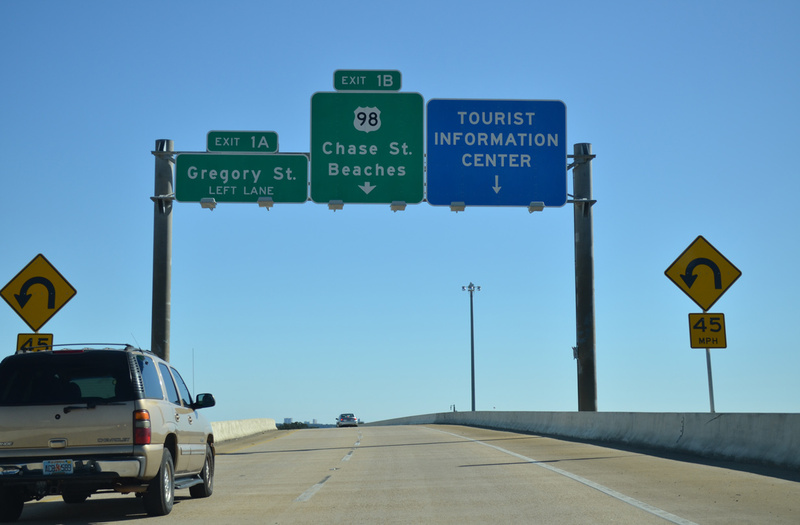 This scene looks at the 0.75-mile guide sign for Interstate 10. 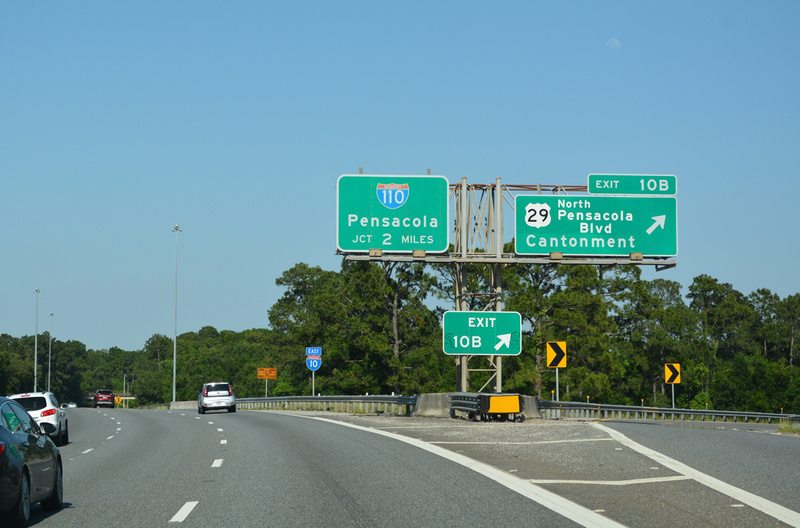 I-10 joins the Pensacola area with Mobile 58 miles to the west. Photo taken 11/19/15. 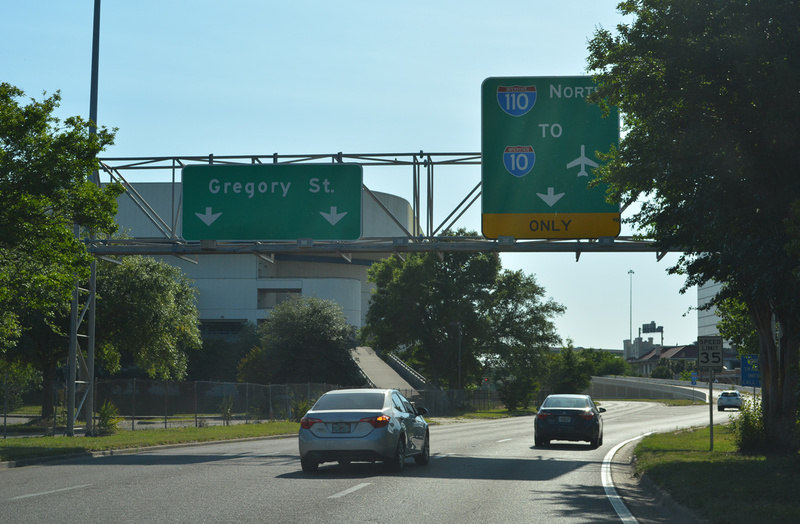 The Interstate 110 mainline defaults onto Interstate 10 west, but with one overall lane. 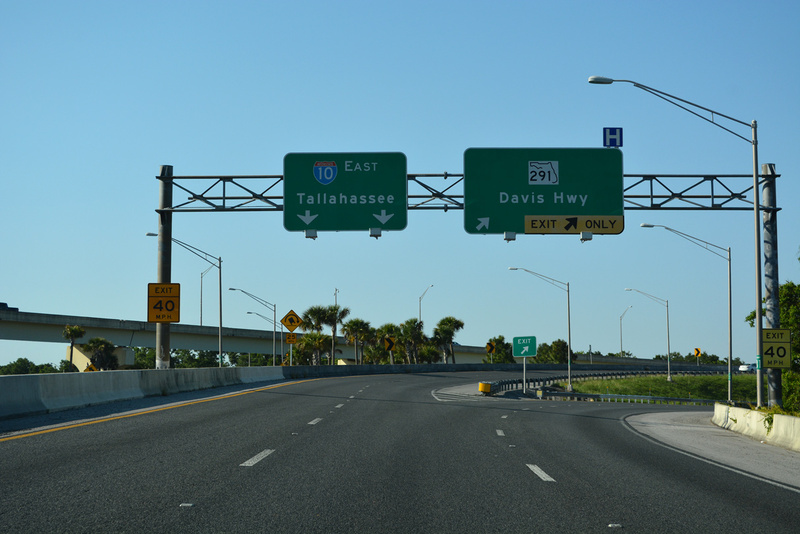 Exit 6 to Interstate 10 east expands to three lanes with the right two joining the Exit 13 distributor roadway of I-10 east to Florida 291 (Davis Highway). Photo taken 11/19/15. 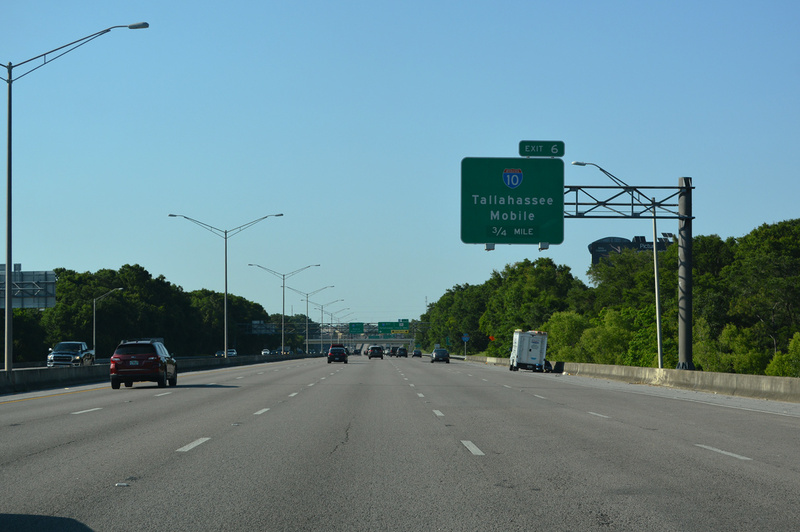 Interstate 110 ends as Exit 6 departs for Interstate 10 east to Tallahassee. Originally the Exit 6 ramp joined I-10 east ahead of the off-ramp to SR 291. Road work completed in 2008 partitions those movements into separate ramps, eliminating the previous weaving traffic pattern. Photo taken 11/19/15. Florida 291 follows Davis Highway north to U.S. 90 Alternate (Nine Mile Road) near the University of West Florida. The movement from Interstate 110 north to SR 291 north is a popular commuter route. 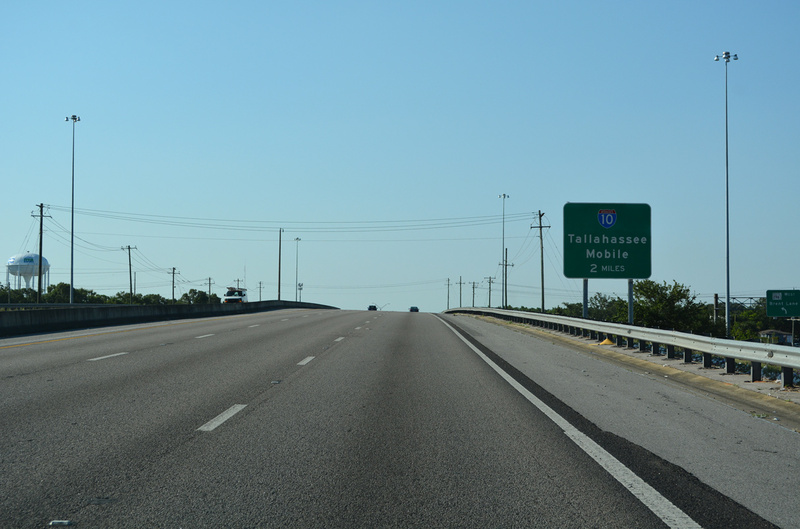 Interstate 10 east otherwise continues 190 miles to Tallahassee. Photo taken 10/19/10. 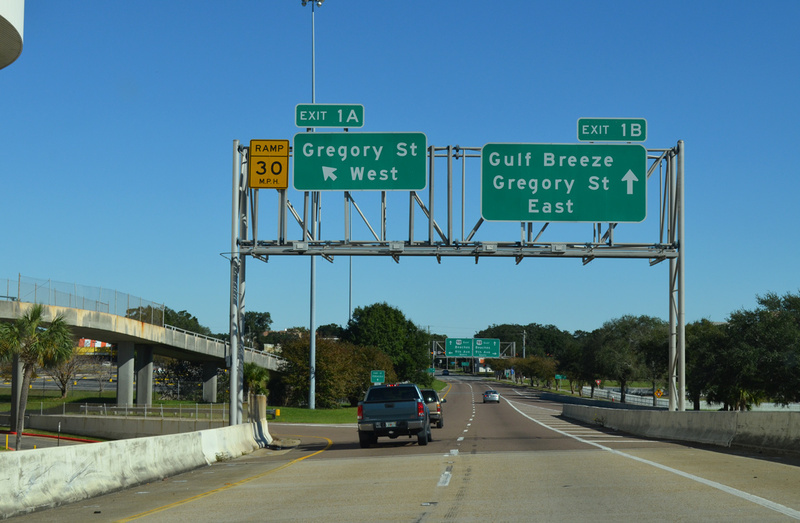 Ramps simultaneously merge and depart from Interstate 10 at U.S. 29 (Exit 10B), two miles ahead of Interstate 110 south. Photo taken 05/12/16. The on-ramp from U.S. 29 north onto Interstate 10 east forms a third lane to Interstate 110 south (Exit 12) and Florida 291 (Exit 13). Construction from spring 2016 to summer 2017 extended the left-hand on-ramp from U.S. 29 south as the third through lane. Photo taken 05/12/16. Interstate 10 east expands to four lanes in anticipation of the two-lane off-ramp (Exit 12) to Interstate 110 south. Pensacola Beach is a 14.5-mile drive south via I-110, the Pensacola Bay Bridge (U.S. 98) and the Bob Sikes Bridge (County Road 399). Photo taken 05/12/16. 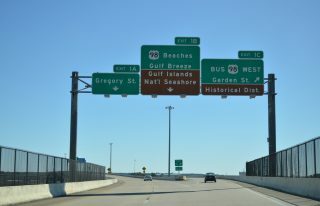 Exit 12 departs Interstate 10 east onto Interstate 110. 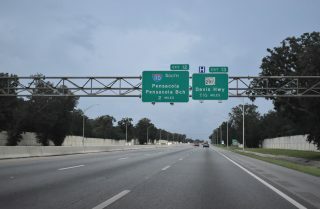 I-110 south connects with Florida 750 (Airport Boulevard) east to Pensacola International Airport (PNS) at the succeeding exit. Photo taken 05/12/16. Two miles east of the modified trumpet interchange between Interstate 10 west and Interstate 110 south (Exit 12). Construction through 2017 expands I-10 to six overall lanes from SR 281 (Avalon Boulevard) east to SR 291 (Davis Highway). Photo taken 11/20/15. 2002-08 construction of Interstate 10 expanded the freeway to six overall lanes through both Exits 13 (Florida 291) and 12 (Interstate 110 south). 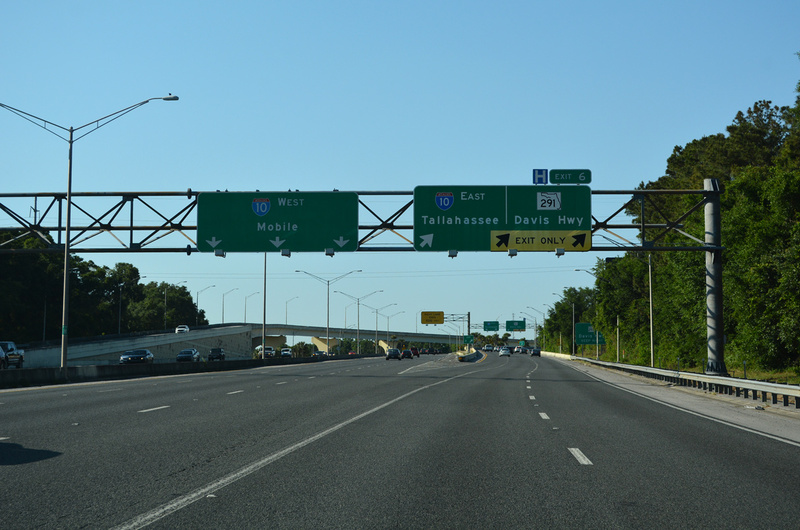 Additionally movements between the folded-diamond interchange with Florida 291 (Davis Highway) and Interstate 110 were separated from the I-10 mainline. Photo taken 11/20/15. Approaching the Davis Highway off-ramp, Interstate 10 is now within a half mile of Exit 12. A new flyover was constructed during 2002-09 construction for Interstate 110 south at Exit 13. This replaced a loop ramp that now serves traffic from Florida 291 south to the Pensacola freeway spur. Photo taken 11/20/15. 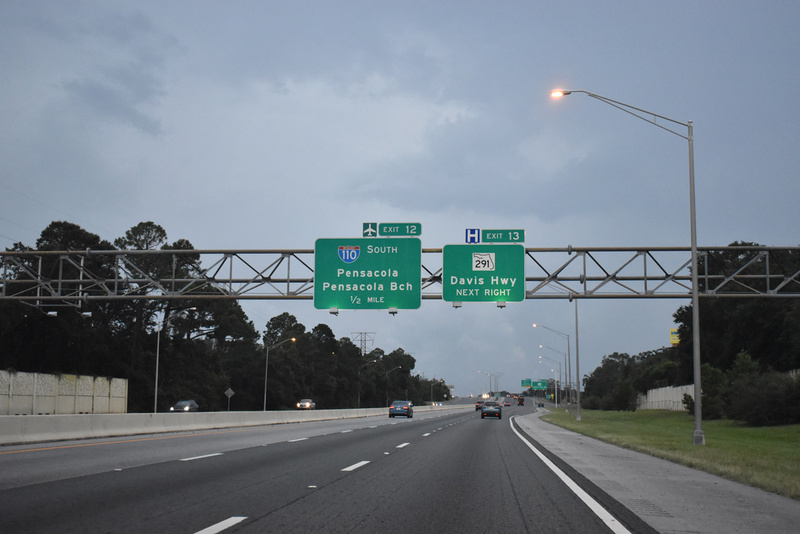 Crossing over Davis Highway, Interstate 10 expands to four lanes for the two-lane ramp to Interstate 110 south. Downtown Pensacola is a seven mile drive via I-110 to Exit 1C. Photo taken 11/20/15. 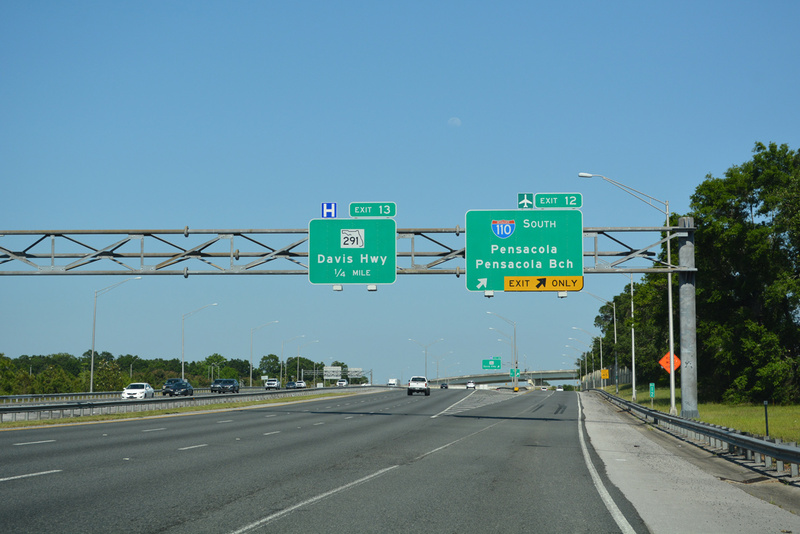 Interstate 10 westbound at the flyover (Exit 12) to Interstate 110 south. Bridges are painted light yellow and adorned with Blue Angel miniatures to honor the flight demonstration squadron based out of Pensacola Naval Air Station. Photo taken 11/20/15. The Interstate 110 southbound viaduct soars high above Jackson Street at the Exit 1C partition to Downtown Pensacola via U.S. 98 Business (Garden Street) west. The mainline continues to the split of Exits 1B/A. Photo taken 11/22/15. 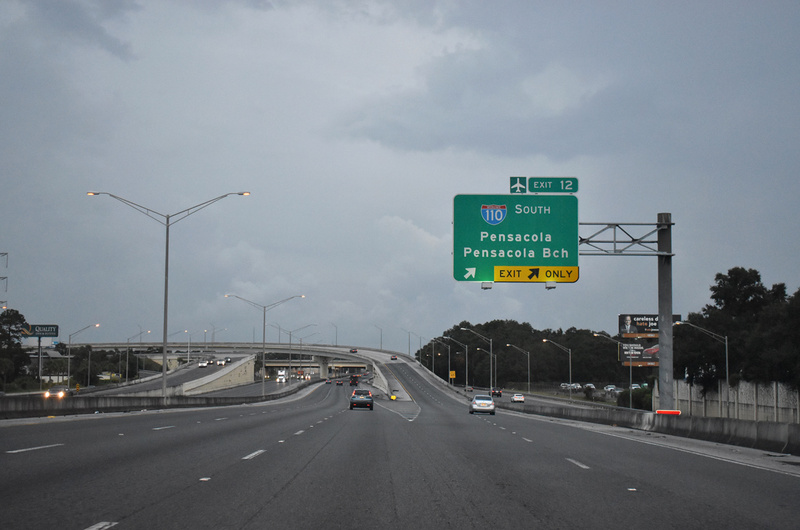 Condo towers from Pensacola Beach coming into view, Interstate 110 turns eastward and lowers to the split of Exit 1A to Gregory Street (U.S. 98 Business) west and Exit 1B onto Chase Street east and U.S. 98 (Ninth Avenue). Photo taken 11/22/15. Signs posted at the split of Exits 1B/A omit U.S. 98 Business, which runs west by Pensacola Bay Center along Gregory Street and east on adjacent Chase Street from Garden Street. Photo taken 11/22/15. 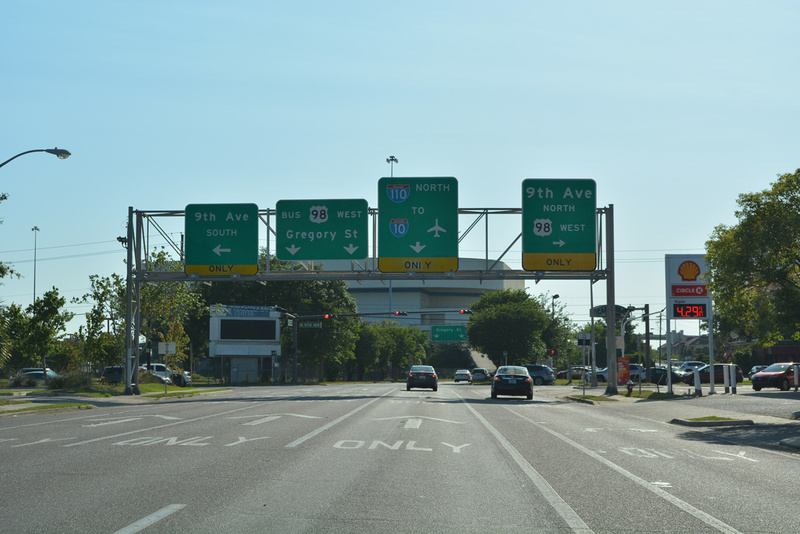 Exit 1B defaults drivers onto Chase Street (U.S. 98 Business) east at the intersection with Ninth Avenue. U.S. 98 turns east from Ninth Avenue onto Chase Street for the approach to the Pensacola Bay Bridge. Photo taken 11/19/15. U.S. 98 west turns from Gregory Street onto Ninth Avenue as U.S. 98 Business commences. Interstate 110 begins a short distance to the west. 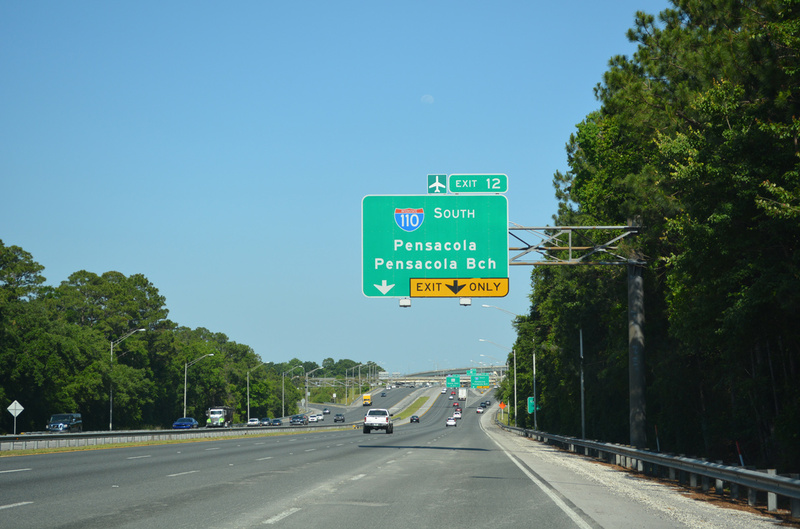 Signs for the Pensacola freeway spur northbound only feature trailblazers for I-10 and Pensacola International Airport (PNS). Photo taken 11/19/15. 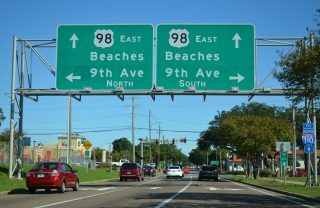 U.S. 98 Business (Gregory Street) splits with the northbound beginning of Interstate 110 next to the Pensacola Bay Center. The northbound ramp carries one lane and merges with two lanes from the Chase Street on-ramp nearby. Photo taken 11/19/15. A second on-ramp to Interstate 110 takes off from the intersection of Chase and Tarragona Streets northeast of Downtown Pensacola. This ramp combines with the Gregory Street ramp to form the northbound mainline nearby. 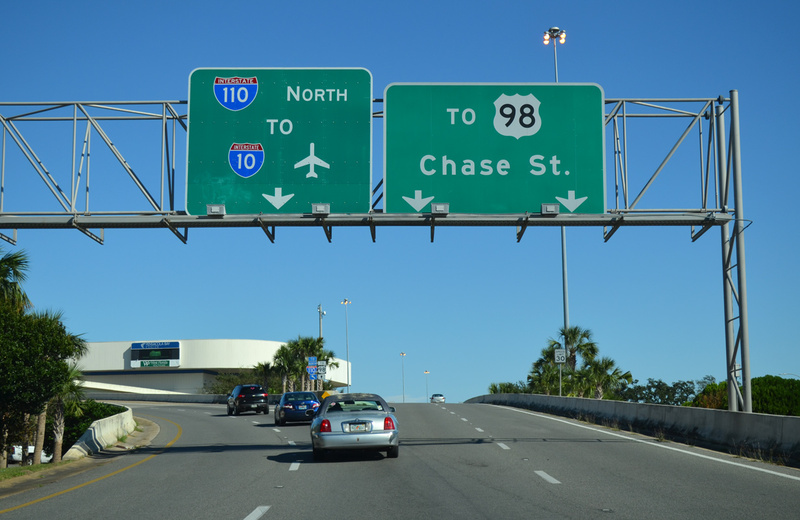 Chase Street east otherwise merges with the south end of I-110 ahead of U.S. 98 (Ninth Avenue) east. Photo taken 11/19/15. i10-i110.com – interchange reconstruction project web site (defunct). Florida’s Interstates: A Half-Century of Progress – official Florida Department of Transportation site (defunct).